Dorothy L. "Dotty" Frizelle was born in Rochester, N.Y., on May 9, 1942. She grew up on a farm near the town of Marion, N.Y., and developed an interest in both music and mechanical things at an early age (she lost the tip of a finger in a tractor generator when she was 4 years old). Her aptitude for the French Horn quickly took her beyond the resources in her high school, and she began taking lessons at the Eastman School of Music under Morris Secon at the age of 15. 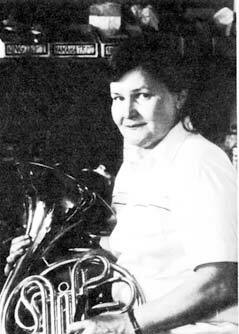 She continued her education beyond high school, and earned her Bachelor's Degree in Music and Performer's Certificate in Horn from the Eastman School in 1964. After playing with the New Orleans Symphony for a year, she returned to Rochester to continue her studies. During this time, she became more and more interested in instrument repair, ultimately making it her vocation and the Horn her avocation. She died, a victim of cancer, on January 8, 1988.